﻿Where can independant artists voice their inner spirit withour compromise? MAP Moreland begins its inaugural festival at Siteworks, Bruswick. MAP’s platform is uncomplicated, inclusive; embraces mix-displines, and importally, steps outside the demands of commoditization - going beyond the need to position themselves to yield to marketing and selling mechanism. Or even predetermind selection criterior of the dominant institutions, hense reclaiming the vigor and engegy in being unique,. This platform is yours. Thank you artists for expressing your desire to show your creativity, to knit collaborative community of friendship and inter-support. MAP embodies a very wide range of audience. No one can help but recognise the returning to the basic drive of why are artists and why we do what we do – back to the original genesis of creative impulse. ﻿MAP Moreland begins its first festival at Siteworks in Brunswick. .
MAP Moreland will inhabit the main two-story ‘house’ at Siteworks. 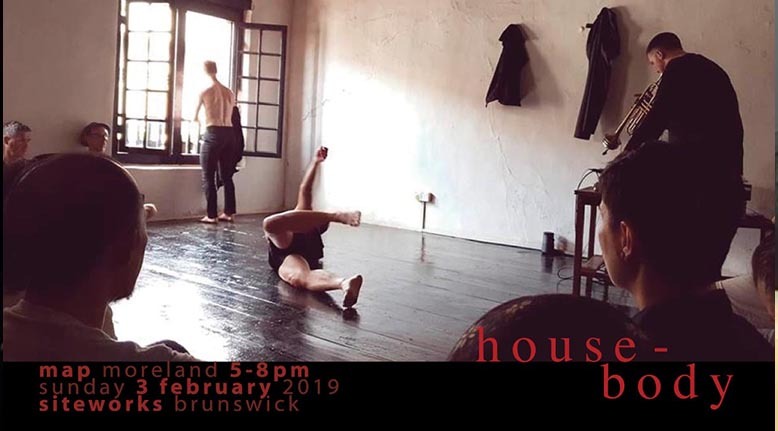 Artists perform and install their work within the labyrinth of rooms like nooks within 'a house-body', Arachne’s Twine relates to the creation of a network as in the weaving of a web. Every artist’s work will represent a kind of thread in a spider’s web that exists in a ‘nook’ or a room. In this space the artists are not so much interpreting narrative, but rather, tracing trajectories to make perceptible what they can do. Here in this spacio-temporal event, lines of narrative may emerge from undertones created when the artists map or cartograph their nomadic passages. This is done using dance, sound, vision and movement without biases of formal language. MAP Festival began in 2008 in Malaysia as the Melaka Arts and Performance Festival. Over the last decade, the model of site-specific performances have co-inspired sister festivals with Arts Island Festival & Pelem Arts Festival (Indonesia), Bandung International Arts Festival (Indonesia), MAP Delhi (India), MAP Rainbow (Regional Victoria, Australia), Buffalo Fields Festival (Bangkok, Thailand), and Melbourne’s own Mapping Melbourne. All these festivals began with site-specificity and have created platforms for independent artists from different disciplines, cultures and levels of accomplishments to present works in individual, collaborative and always experimental creative practice. ﻿MAP Moreland acknowledges the Wurundjeri people of the Kulin nation, the traditional owners/ custodians of the land on which we meet. We pay our respects to the Elders past and present.